Raun proactively scouts for discarded raw materials. His custom framing service has access to “over ten thousand feet of material to choose from in stock at all times” and is acquired at local sources within Chicago and surrounding areas. The value of adjacency is demonstrated here. Raun’s confession of continual learning echoes that of sculptor, painter, and poet Michelangelo who said, “Ancora Imparo.” One of the translations is “Still I learn!” Reinforced with each CreativeMorning event, learning—and its counterpoint in relearning—is what essentially makes life worth living. Raun has an old soul’s fondness for the colors and textures of objects, which reveal a unique patina that only history affords. Coinciding with the search of the new are yearnings for things that are no longer used or even abandoned. 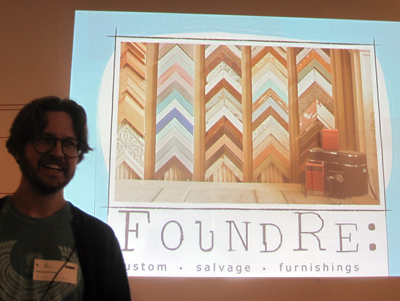 In addition to reclaiming discarded materials for their custom frames and furniture, FoundRe also collects vintage items. The historical record plays on, particularly when it informs a way of seeing that Raun cherishes. Get local. Keep learning. Explore the tremendous range of “old stuff”: classic, vintage, retro, midcentury, and more. Raun’s talk reminded me of a delightful trip to Augusta, Georgia. This happened to include a visit to an antique store. Big thanks to: Design Cloud for sponsoring and hosting Chicago CreativeMornings #16; to organizers Kim Knoll and Kyle Eertmoed of Knoed Creative (who spoke at Chicago CreativeMornings #7), videographers Chris Gallevo and Brian Wong, Isaac Stein for greeting, and the rest of the Chicago CreativeMornings crew for their great work on making CreativeMornings happen in Chicago; to Open Books for accepting donated materials in the spirit of CreativeMornings global March 2013 theme of Reuse. Typeface of quotes is Trixie designed by Erik Van Blokland in 1991. It’s inspired by an old typewriter, which was used to capture the variable quality of typewritten letters. 2011 was Chicago CreativeMornings’ most excellent debut year. 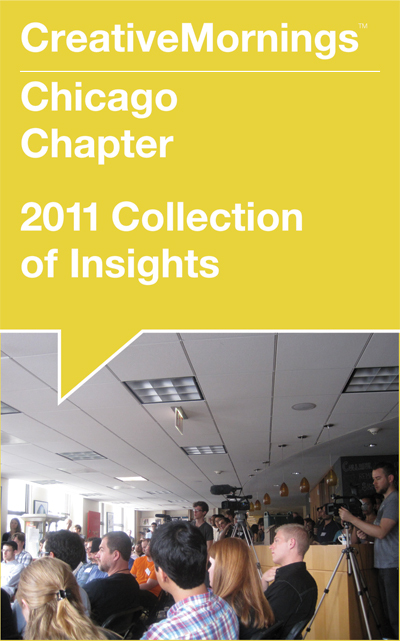 Download the collection of insights.